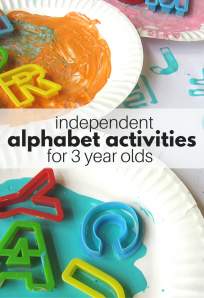 I love doing active alphabet activities with my toddler. They don’t have to be big running or throwing games ( although those are great too) just simple ones that aren’t restricted to a table or sitting. The other day on the walk to her brother’s bus stop she pointed to the half moon and declared ” A lowercase moon Mama!” and since that declaration we’ve been exploring and seeking out more lowercase letters in our books. 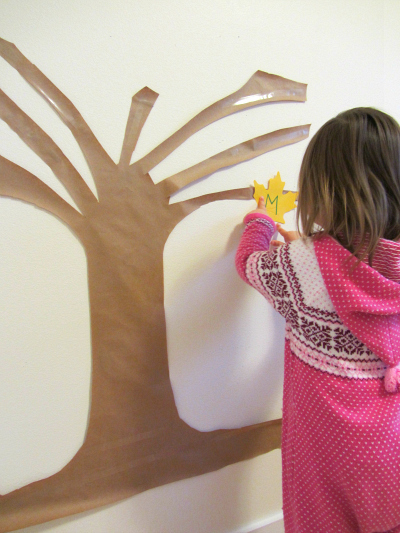 As you will see this activity was still challenging for her as I thought it would be but we worked on it together and I have left it up in our playroom to use as a talking point . In a class it would be a great group project too. For more alphabet ideas for beginners check out all of our Alphabet For Starters series. Gather your materials. 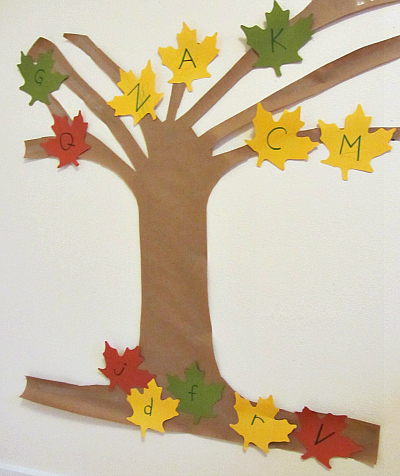 You will need some craft paper , scissors, fall leaves ( make your own or pop to the dollar store before they all disappear) , markers , painter’s tape and double stick tape. I also have a container of crayons because my daughter wanted to color some of the leaves as well. 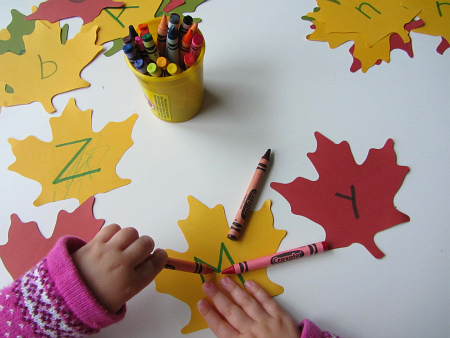 Start by writing out a variety of upper and lowercase letters on the leaves. I did half the alphabet in upper and half in lower. Do however many you want in any combination. Remember we are playing not drilling. I made a good number of letters that are the same in either one too. This builds some freebies in which is always good for confidence building. 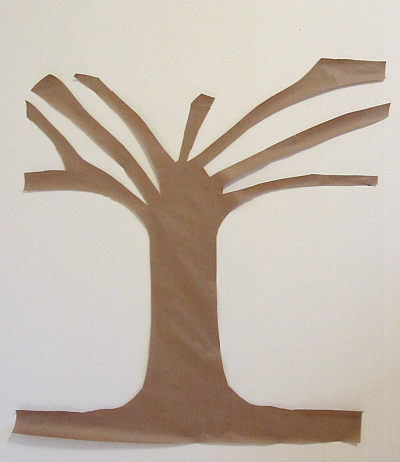 Next make a bare tree with your craft paper. I cut free hand because I am way better at cutting than drawing. Do what works for you. Attach it to the wall with painter’s tape. 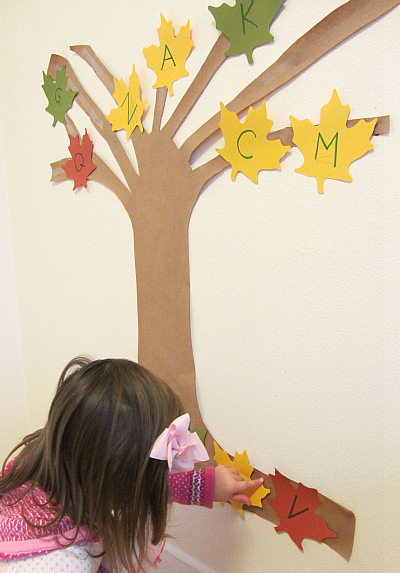 While you do that if you have a little artists with you waiting to learn let them color the leaves and don’t forget to slip in a few ” You are coloring the uppercase m !” etc… getting into the habit of labeling what they are doing really helps make it more natural and it teaches them in such a natural way. Add double stick tape to the branches and the roots. Now ONLY use this if you are not planning on repositioning the leaves. They can be taken off and moved immediately but after they are on for a few minutes they will rip. If you need to be able to move them use contact paper sticky side out held on with permanent double stick tape. 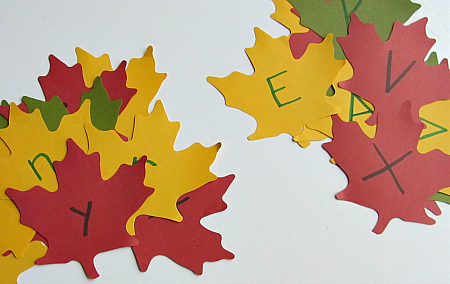 Make a pile of leaves and start sorting. She always starts with her first initial. You will have to explain to your child that upper case letters go on top and the lowercase on the bottom. I try never to use the terms big and little since you can have a 6 foot high lowercase b or a tiny uppercase one. Using the proper terms especially when they are just starting out really helps. I found myself saying ” Upper goes up and lower stays low!” as we went through the letters. 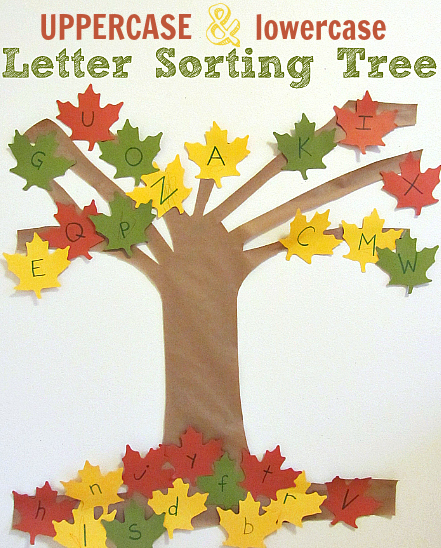 Encourage them to find letters they know or like and then hand them ones that maybe they are struggling with. 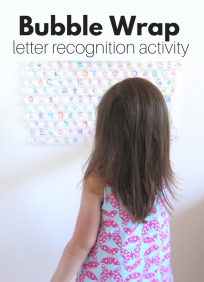 My daughter is only 2 so I am not purposefully handing her any letters yet as it’s all introduction and play. If she was older and mixing up b and d I would target that or maybe g and j … do not turn this into drill and test. It’s hard not to sometimes but keep it light and fun. If your child puts a uppercase letter with the lowercase don’t worry instead ask them about it they may be confused and you can address that, they may have a really good only a 4 year old can think it up reason or they may catch their mistake and correct it themselves which is 20 times better than having someone correct it for you. This is as far as she went and I was thrilled . I sorted the rest out loud as she played with her doll house next to me. 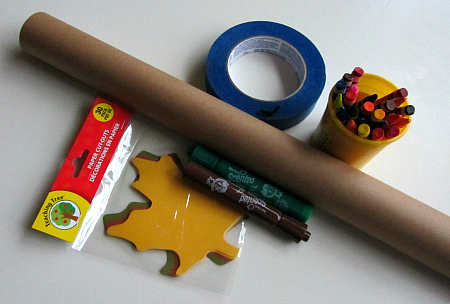 This activity can be great in the classroom too! I love ideas like these! This is cute! 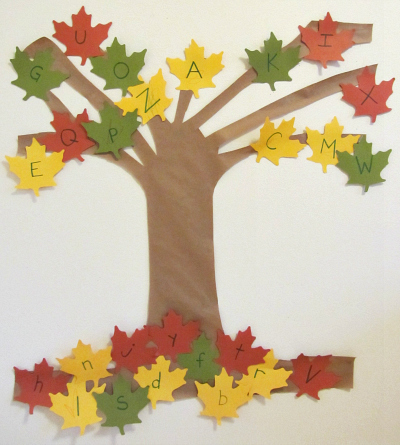 My little one is 5, so I’m going to have him spell out some simple words with the leaves. I like the idea of dried leaves too Aurore. Thanks! Oh my cuteness! I love this blog. I’m so impressed by people like you who can create these type of ideas. 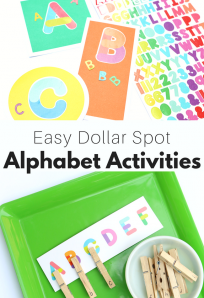 Many good ideas to here to try with my three little kiddos! This is lovely! I really love this blob. Super cute! You could even do this with proper and common nouns.